As Bill has already mentioned, it was yet another great weekend! We were joined by 18 FEPOWs, plus wives, widows and Associate members - there were over 70 of us staying at the hotel and 90 at our Saturday night dinner. We had 3 FEPOW Club Presidents in attendance; our own Bill Marshall, Pam Stubbs from the Birmingham FEPOW Club and Margaret Ryall from the London FEPOW Remembrance Social Club. 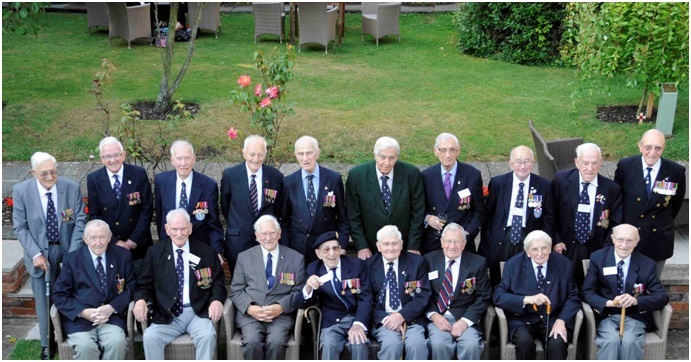 As you can see from the lovely FEPOW group photo below we welcomed; (front) Stan Vickerstaff, George Reynolds, William Mundy, George Gaskell, Vic Pugh, Bill Marshall, Mac McDaniel, Tom Boardman and (back) Harold Pleasance, Maurice Naylor, Ron Mockford, John Baxter, Bill Frankland, Harold Lock, Bob Boocock, Bill Macauley, Herbert Gregory and Tom McKie. And behind them on the right is our FEPOW tree in the garden at The Falcon Hotel. 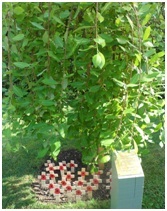 The tree was planted during our reunion in 2011 and now has the plaque positioned. Many of us plant poppy crosses and have a quiet moment to remember and honour our FEPOWs whilst we visit. 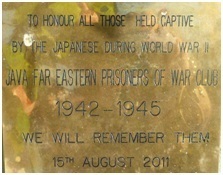 It also raises awareness of the FEPOW experience to other guests throughout the year. We were joined for the first time by George Gaskell and his lovely daughter Christine, and it was great to have widow members Sheila Brede, Elsie Edwards, Edna Fry, Gill Hopkinson, Olive Ladmore, Carol Privatt, Margaret Ryall, Pam Stubbs and Joyce Wilgoss with us again, along with their old friends and FEPOW wives, Flora Winter, Brenda McDaniel & Elsie Pugh. We quickly got the business end of our trip, the AGM, out of the way on the Saturday morning, and afterwards everyone got to speak to introduce themselves to the group which prompted some fascinating memories and coincidences for researchers to get together with FEPOWs and other family members to learn more. We were joined by Andrew Glynn, our Australian member who lives in the Far East and helped organise our Indonesian trip in 2012. 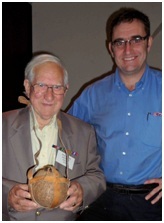 He brought William Mundy a fresh coconut to put in his wartime coconut holder. It was the first full reunion of all who had made that emotional and rewarding trip to Singapore and Indonesia, and now included our newest and youngest member, Joe Crofts, son of Jacq& Alan! Meaning our youngest attendee was 3 months old and our oldest 102!! Our Sunday morning Remembrance Service was efficiently organised as ever by our friends at the RBL, and Margaret and I had worked on a new order of service which was ably taken by Reverend Neville Beamer, after which we were all welcomed at the RBL Club.